2015 was officially the safest year on New York City streets since record-keeping began in 1910, thanks to the city’s Vision Zero program. Traffic fatalities went down 22% since 2013, before Vision Zero was launched. Mayor announces $115 million in new capital funds to build on Vision Zero progress, including Safe Routes to Schools and traffic calming measures on key thoroughfares. Vision Zero specific priorities for 2016 include traffic calming measures on key thoroughfares and safer cycle routes. The city is also piloting a 100-intersection initiative to test safer left turn designs and plans to increase the use of speed cameras to target times and locations where crashes most often occur. 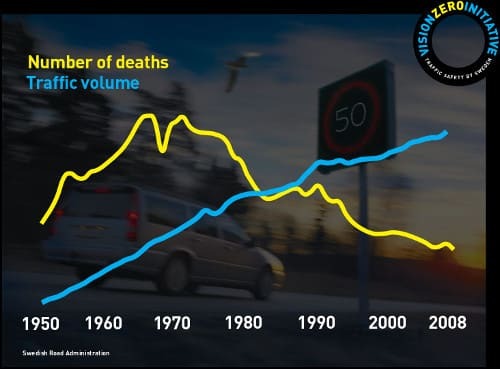 The Vision Zero is the Swedish approach to road safety thinking, and it is based on the idea of no loss of life is acceptable. This approach has proven highly successful. It is based on the simple fact that we are human and make mistakes. The road system needs to keep us moving. But it must also be designed to protect us at every turn. Mobility is crucial for all parts of society. But more traffic means more fatalities and injuries on the roads. Humans are not made to travel at high-speed. We make mistakes. Thus, an effective road safety system must always take human fallibility into account. Transport systems traditionally place responsibility for safety on road users. The Vision Zero Initiative puts this responsibility on system design. The Vision Zero approach to road safety is highly effective. Traffic-related fatalities are falling even though traffic is increasing.